To bring the differently abled people to the mainstream of society, JSSMVP is running Sahana Schools and a Polytechnic for the differently abled. 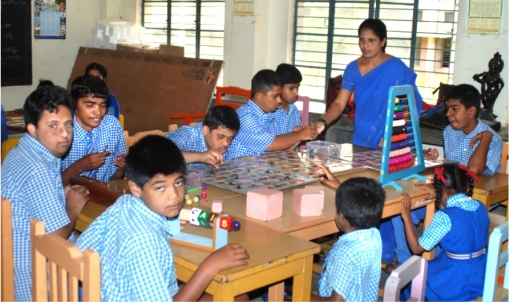 The Sahana schools( School for mentally challenged students to bring them to the mainstream) were started in Bengaluru and Mysuru to educate the differently abled children and create awareness among them about their rights and responsibilities and to bring out their talent and potential and integrate them with the mainstream society. At Sahana schools, children are taught by specially trained teachers and integrated with the regular students. The JSS Polytechnic for the Physically Challenged was started in 1991, and the new building was inaugurated by the then Hon’ble Prime Minister Sri Atal Bihari Vajpayee in January 1999. This Polytechnic is a first of its kind in India that offers six diploma courses. The Dept. of Human Resources, Govt. of India, considers this institute as a resource centre to improve technical and professional education for the differently abled.